Greetings again from the darkness. “It’s always a sunny day when Christopher Robin comes to play.” You know when it’s not a sunny day? When grown man Christopher Robin ignores his wife and daughter to work every waking hour at his job as an Efficiency Manager for a struggling luggage company. Whatever made the filmmakers spend so much time here on the gloominess of adulthood is beyond me, but oh my, when the friends all reunite in the Hundred Acre Wood, it’s truly a joy to behold. 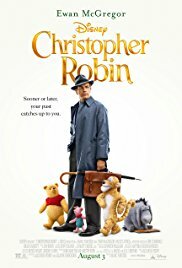 It was only last year when GOODBYE CHRISTOPHER ROBIN hit the theatres, and while that was more of a biopic of A.A. Milne and the origin of Winnie the Pooh, this version focuses instead on the adult Christopher Robin, and how responsibilities can rob us of all the joys of childhood if we aren’t careful. Ewan McGregor plays the grown-up Christopher Robin, and we see him back from WWII as a boring workaholic who has little time for his wife Evelyn (Hayley Atwell) or daughter Madeline (Bronte Carmichael). The story begins with young Christopher Robin (Orton O’Brien) sharing a farewell lunch with his friends just before he heads off to boarding school, leaving his childhood far behind. In addition to Pooh bear, we also see Rabbit, Piglet, Owl, Kanga and Roo, as well as a bouncy Tigger and classically mopey Eeyore. It should be noted that these aren’t the animated creatures you and your kids are accustomed to. These are stunning CGI stuffed animals modeled after the early drawn images of Ernest Shepard. They are lifelike … as much as talking stuffed animals can be … and kid viewers are likely to fall quickly for them. There are three screenplay credits: Oscar winner Tom McCarthy (SPOTLIGHT), Oscar nominee Allison Schroeder (HIDDEN FIGURES) and Alex Ross Perry (LISTEN UP PHILIP). Their work is based on a story from Greg Brooker (STUART LITTLE) and Mark Steven Johnson (SIMON BIRCH), and of course the characters from AA Milne and Ernest Shepard. It might not surprise you that the director Marc Foster also directed the excellent FINDING NEVERLAND, but it’s a bit eye-opening to think he also directed MONSTER’S BALL and QUANTUM OF SOLACE, neither of which have a single scene that kids should watch! Despite the heavy gloom of the portion of the story dealing with Christopher Robin’s family and job, the film (and the kids in the audience) lights up when all the friends are on screen. Playing the “Say what you see” game on the train emphasizes that creativity sprouts from nothing (doing nothing is a recurring theme in the Pooh stories), and of course, the ever-present red balloon plays a role (much different than the red balloon in IT), as does the familiar “Winnie the Pooh” song from 1977, which most everyone in the audience hummed along with in its various pop-ups during the movie. The voice acting is necessarily superb, and credit goes to Jim Cummings as both Pooh and Tigger – roles he also voiced in the animated series and previous animated films. Of course the great Sterling Holloway was the original Pooh voice, and he passed away in 1992. Nick Mohammed is Piglet, Peter Capaldi is Rabbit, Sophie Okonedo is Kanga, while Sara Sheen is Roo. Toby Jones is Owl, and Brad Garrett gets some of the film’s best and funniest lines as everyone’s favorite downtrodden donkey Eeyore. Pooh, the ‘silly old bear’, states “People say nothing is impossible, but I do nothing every day.” This type of humor and philosophy goes on throughout the film, whenever the friends are on screen. The moral of the story is that it’s crucial that we maintain some sense of childhood wonder and joy, even as adult responsibilities close in on us. If you can wake up each morning and say “Today is my favorite day”, you are likely not a bear of little brain … plus you’ll avoid Heffalump traps!